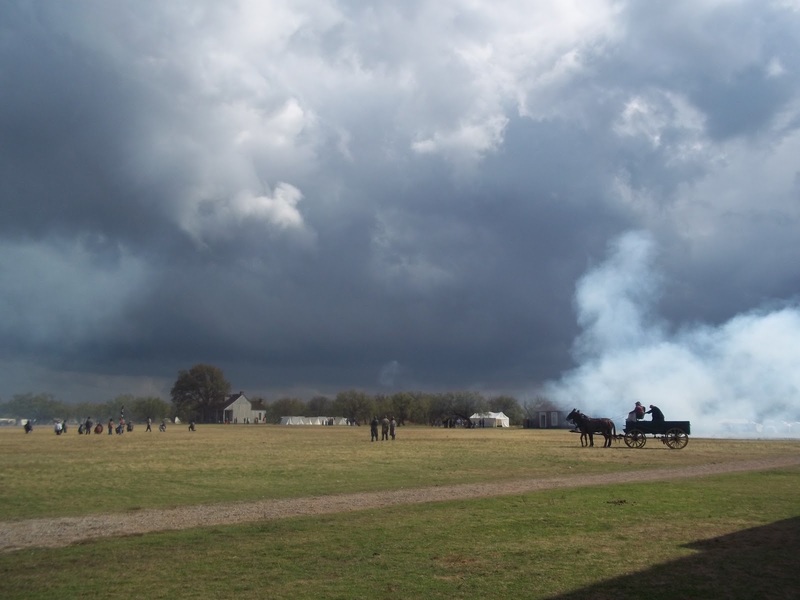 The second annual Civil War Reenactment was held at Fort Richardson in Jacksboro, Tx. Forces from the Union and the Confederacy took to the field in battle, bringing to life a skirmish that never really happened. 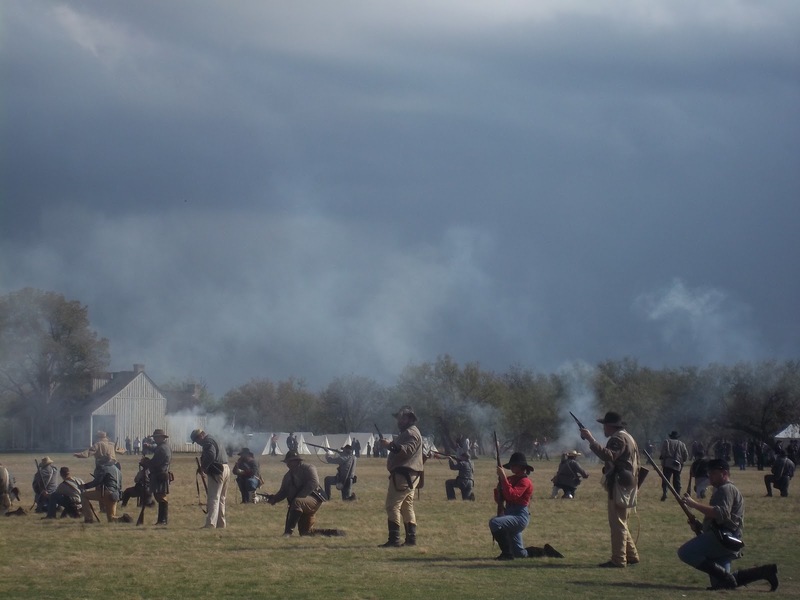 Except for a few along the Gulf Coast, there were no Civil War battles in Texas to be reenacted. But that doesn’t stop these weekend historians, and it didn’t stop us, or I should say my son, from wanting in on the fun! Fort Richardson held their first reenactment last year, in September. On the 100+ degree day, it was so hot that the actors were happily lying down, feigning mortal injuries. It was there that my son befriended one of the Confederate soldiers, who had escaped to the shade of the Mesquite tree we were sitting under. He told my son, then 10 years old, that if he were to show up in time accurate clothing the next year, that he could participate with the other boys on the field, who were holding the flag and some were carrying drums. For it’s second year, the reenactment was moved to the first weekend in November. 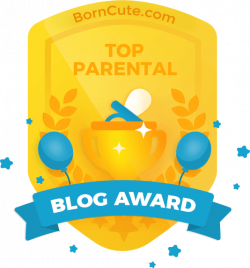 My son had been asking about it since September, so I knew he was still interested in participating. I made a few phone calls, and spoke with Glen, the park’s interpretive director. He told me it would be easiest to purchase Cole’s clothing at the park from the vendors, so that he could try them on. 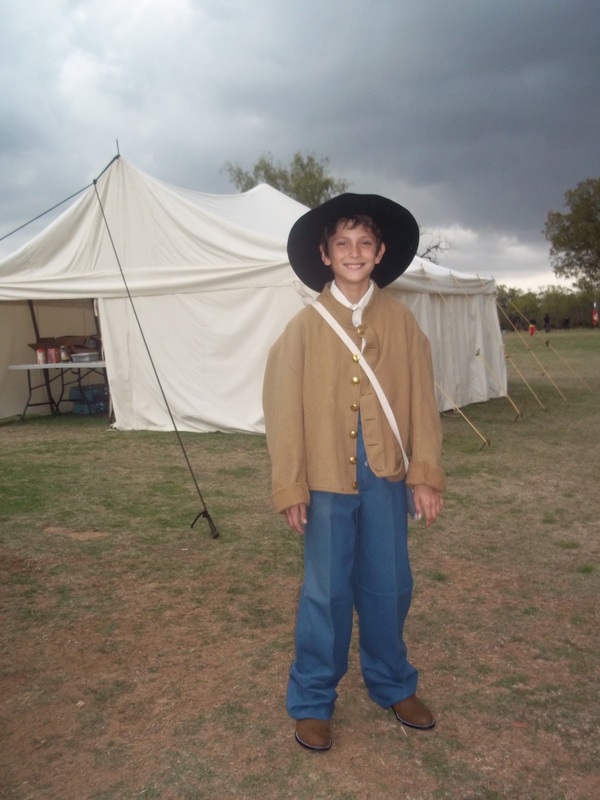 He also reassured me that the guys at the reenactment were super, and would probably be happy to let Cole participate. Because of prior soccer obligations, we weren’t able to go out until Sunday. We had purchased Cole a pair of Justin Ropers, but nothing else. There is little online for children’s clothing, although I did find patterns, which made me wish I owned a sewing machine… or know how to sew. But I can’t, not even a button. It’s on my bucket list. I won’t bore you with the details of how we tracked down his appropriate clothing, and someone who would let him participate, but we owe a great amount of thanks to Saddler to the 6th. They had everything Cole needed but a vest, so they loaned him a jacket. Great bunch of folks! Cole then went and joined up with his unit. He was to be a runner, running messages to and from different unit commanders. I admit to still not understanding the different units. However, once again, the men that put him to “work” were wonderful, and happily accepted him! We left him and grabbed a seat on the porch of the “hospital” to watch the battle with the other spectators. While it had drizzled on and off all morning, just as they were getting started, a light rain descended that lasted most of the battle. The dark clouds on the horizon added a beautiful contrast to the smoke of the cannons. We laughed as Cole was sent running around the battlefield, with a hand perched atop his head to keep his new “slouch” hat on as he ran! He had a wonderful time, and can’t wait until the next reenactment! If you are interested in more information regarding Civil War Reenactments, here are a few sites that proved invaluable to us!